Rainbow Land Crabs are found along river and costal areas of west Africa. With a blue to purple carapace and bright orange to red legs, they make an attractive pet. What does a Rainbow Land Crab look like? 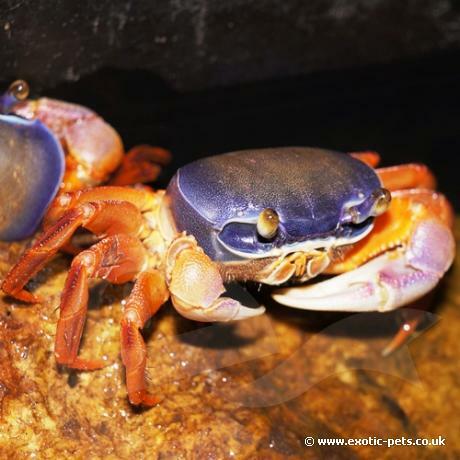 The Rainbow Land Crab is a brightly colour crab. They have a blue to purple carapace and orange to red legs. The males are more colourful compared to females. It has been known for specimens to reach sizes of 15-20cm (6-8 inch) across the carapace, average size is smaller at around 10cm (4 inch). Their average lifespan is two to three years. Where are Rainbow Land Crabs from? Rainbow Land Crabs can be found living within burrows along river and/or costal areas of west Africa, they are mainly imported from Nigeria. How do you keep Rainbow Land Crabs? You will require a glass or plastic tank (latter being cheaper) with a floor space of at least 30cm for one Rainbow Land Crab. You can keep this species together but is advised to house in larger enclosures with plenty of hides. In their natural environment, they would make burrows in the mud along the waters edge. You can use the Exo Terra Riverbed Sand or a sand/soil mixture. Place at least 2 inch, ideally 3-4 inches of the substrate in your enclosure with stones, cork bark and other items as hides. Not much information can be found on the temperatures that Rainbow Land Crabs should be kept at. We keep ours in a warm reptile room, temperatures range between 20-24C. We have heard that UV lighting is not essential, but this does bring out their colours and may help when shedding their exoskeleton. You can provide Rainbow Land Crabs with either fresh or brackish water. If using water from your tap, you must allow this to stand for at least 24hrs or treat with a de-chlorinator before placing in with your pet crab/s. Depending on the size and type of set you have, the use of a water dish makes changing and maintaining the water easier, where as a 50/50 land and water makes the enclosure look more natural. Feeding Rainbow Land Crabs shouldn't be a problem, they are scavengers and will eat pretty much anything you offer. Give them a varied diet of fruit, vegetables, bloodworm, fish, pinkies, turtle or crab pellets. Also provide some cuttlefish as we believe they may require this for their exoskeleton.